I’ve been at it again. I nourished my skin. With a pure charcoal tissue mask impregnated with black algae. To my credit, I restrained myself and waited till the father-in-law was safely tucked away in his home in Queensland. Just in case, you know, he got scared. Himself is so used to it, I did not take his reaction into consideration. However, it was satisfyingly horrified when I appeared in his office looking like a terrorist home invader wearing a black mask. Charcoal has been used in health care for a long time. Did you know you can whiten your teeth with it? On the weekend I was watching a webinar on natural health care and the woman said she uses charcoal to whiten her teeth. They were sparkling. That’s the first I’d ever heard of that. Oil pulling, yes. Charcoal, no. Check out this link for loads more uses. You’ll be amazed, I promise you. I give Tess a charcoal tablet when she gets toxically pongy. Works a treat. But I’ve never used it on the face. Until now. 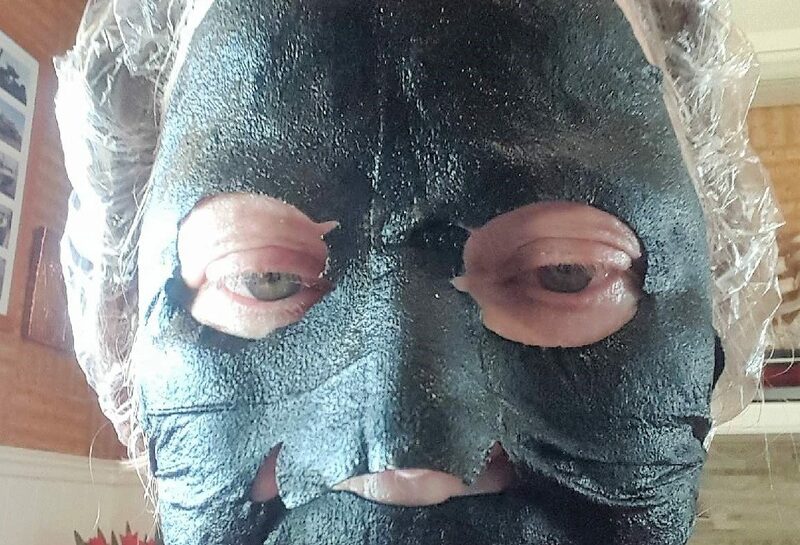 The blurb on the mask packet says “… truly innovative black tissue is infused with charcoal, a centuries old beauty remedy known for its excellent absorbing properties [It does absorb smells!] and ability to draw out stubborn dirt, oil and impurities from the skin.” I was willing to give it a try. Nothing indicated that it would permanently colour my face black. It didn’t. Micro and macro algae are both found in skincare and boast numerous benefits. Most notable, perhaps, is its ability to instantly hydrate and condition the skin. Upon using products containing this ingredient, you’ll notice a more supple, moisturized complexion that’s soft to the touch. Algae is also an antioxidant, meaning it protects your skin from free radicals that cause premature aging. In that sense, it’s an excellent ingredient for those who are worried about aging skin which is, well, most of us! Finally, it is high in essential amino acids, proteins, and a variety of vitamins—including vitamins A, B, C, and E. Talk about a loaded, super ingredient! Having tried both these miraculous skin care products, I can only say that my skin does feel super soft and silky. These tips, in the days when a certain segment of our population is waxing indignant, over thirty-year-old incidents of college students doing “black face”. Just goes to show that there is a use for just about anything. I know, it’s fun ! Maybe Hallowe’en would be a good time to try this out? But if it works … I’ve seen/heard of weirder things!! It worked. There are many options out there for these tissue masks. Maybe they will bring a special one out at Hallowe’en. But you’re a man !